One of the reasons I wanted to start a blog was to be able to chat about genetic genealogy topics that interest people. I can tell what’s on your mind by the questions I receive. For some reason, I’ve received several questions and some complaints about projects and administrators recently, and I think a fireside chat might clarify things a lot. A few questions arrived in my in-box this past week that I’d like to paraphrase and address. The first question is from a male and the second from a female. Question 1 – I’m in a number of projects. One of the administrators contacted me and suggested I do some additional SNP testing. But my surname project administrator has never said anything about this. If I needed more testing, why wouldn’t my surname project administrator tell me about this? Is this legitimate? Question 2 – I’m so upset. I tried to join the XYZ surname project and the administrator told me that I couldn’t. Why can’t they be more flexible and realize I’m related to that family? This project is listed by Family Tree DNA as one I should join, but the administrator won’t let me. I see confusion, misunderstanding and frustration in both of these questions, for both the participants and the administrators. I’d like to talk a little bit about projects, why they are formed, administrators, participants and expectations. There are four types of projects at Family Tree DNA. 1. Surname Projects – The earliest projects formed were surname projects. Those are based on surnames, like Estes, and typically focus on the paternal lines and the Y chromosome and only that specific surname. Herein lies the first point of confusion. Because these projects were formed to sort out male family lines of a particular surname, they are typically restricted to males who carry that surname, or sometimes males who match that surname through adoptions of some sort. Question 2 relates to this problem. From her perspective, she “should be” allowed to join, because she is related. But from a scientific perspective, there is no benefit for a female to join a male focused project. However, from a public relations perspective, it won’t hurt to let her join. Because women’s surnames change every generations, she could theoretically join all the surname projects for all of her ancestors. None of it would benefit her for matching etc., but it won’t hurt anything either. From an administrator’s perspective, having people in a project that can’t advance the goals of the project is simply clutter. Not only that, but we have to do something with them, categorize them somehow, or leave them ungrouped. It’s also confusing to people looking at a Y-line project to see other surnames and apparently unrelated or unconnected people. Conversely, I want people to be happy with genetic genealogy and since she is related and very interested, perhaps she can contribute something in the way of research. 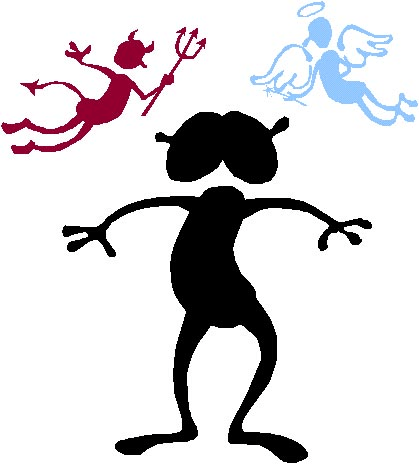 If this sounds a bit like the angel and devil, one on each shoulder talking to each other…..well, that’s because it is and there is no one right answer. There is an exception, of course, to what I just said. It seems there is always an exception to everything. Recently with the Family Finder tests, more and more administrators are including people in their surname projects who are related to that family but who do not carry the surname because it’s the only way we have today of including Family Finder participants and grouping them. I have begun to do this myself as a project administrator. The alternative to this is to begin lineage projects, such as the Johann Michael Miller Descendants project, just for descendants who have taken the Family Finder test. This is a way to know who they are, to group them so that you can work with their results. The challenge is that projects are not set up to function this way. They are set up to display Yline (males) and mitochondrial DNA results, only, or both for a kit, and in this case, the Yline and mitochondrial DNA results are both irrelevant and misleading if they are displayed as valid results. Administrators are trying to figure out the best way to deal with this. 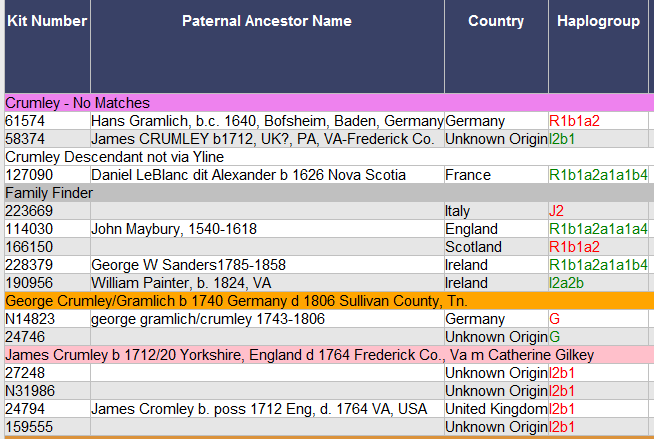 The work-around I’ve implemented is a grouping within the surname project labeled Family Finder where those who are related but don’t carry the particular surname are grouped. I am actively recruiting descendants for these groupings as Family Finder holds great promise in finding those elusive unidentified wives, unnamed children…..but I digress. Here’s what my Crumley project looks like. You can see that the grouping of Family Finder is entirely irrelevant to the rest of the project, but it’s the best we can do under the current project structure. 2. Haplogroup Projects – The second type of project formed was haplogroup projects. These are for both Y-line and mitochondrial. Some haplogroups have only one project, like mitochondrial haplogroup K, for example. Others, like mitochondrial haplogroup H or Y-line R have many subprojects. These projects are a function of who wants to study what – and who is willing to do the work. Haplogroup projects, by and large, are research projects. This means that they are arranged quite differently than surname projects. Surname projects are generally arranged by family and within family, by line, when possible. Haplogroup projects aren’t concerned with surnames, but with deep ancestry and location, and they are arranged by haplogroup and sub-haplogroup. A great deal of the progress in understanding haplogroups, their history, migration patterns and the discovery of subgroups has come from the haplogroup projects. They are very important, make no mistake. Family Tree DNA is the only place in the world where there are groups of people grouped by haplogroup in public projects. This is citizen science at it’s best. The haplogroup Q project had made significant scientific contributions. 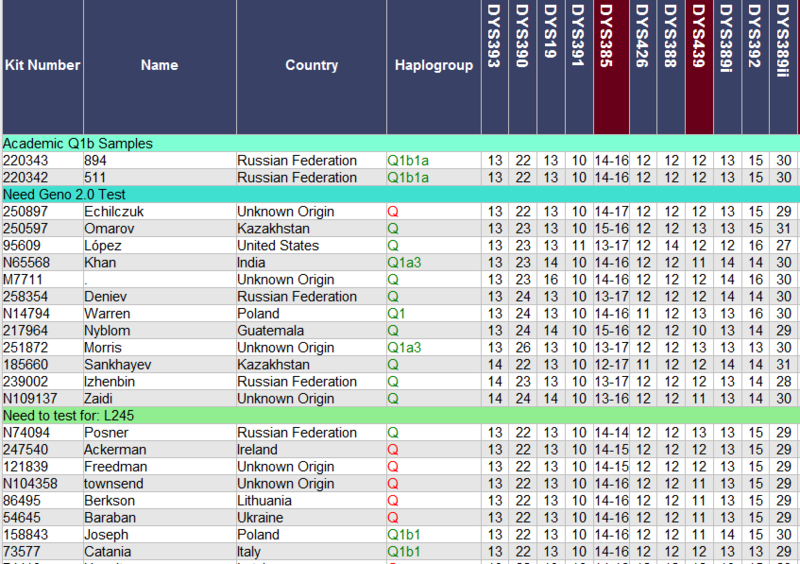 You can see that participants are grouped by haplogroup, meaning by SNP. In some cases, administrators also group participants by the tests needed to further refine their haplogroups. When you refine your haplogroup with further testing, you also refine your personal story and contribute to science as well. Haplogroup Q groups participants by their haplogroup, above, but when they need additional testing, they are grouped with others who need that test, below. Why do they need additional testing? That’s how we learn about haplogroups. Every additional SNP that you test positive or negative for tells us more about migrations, about where your ancestors lived and what they did. The power of this isn’t just in one test, but in many tests combined that write the story of our ancestors. To illustrate the power of many versus one, the mapping function comes to mind. Each project administrator can enable or disable mapping. 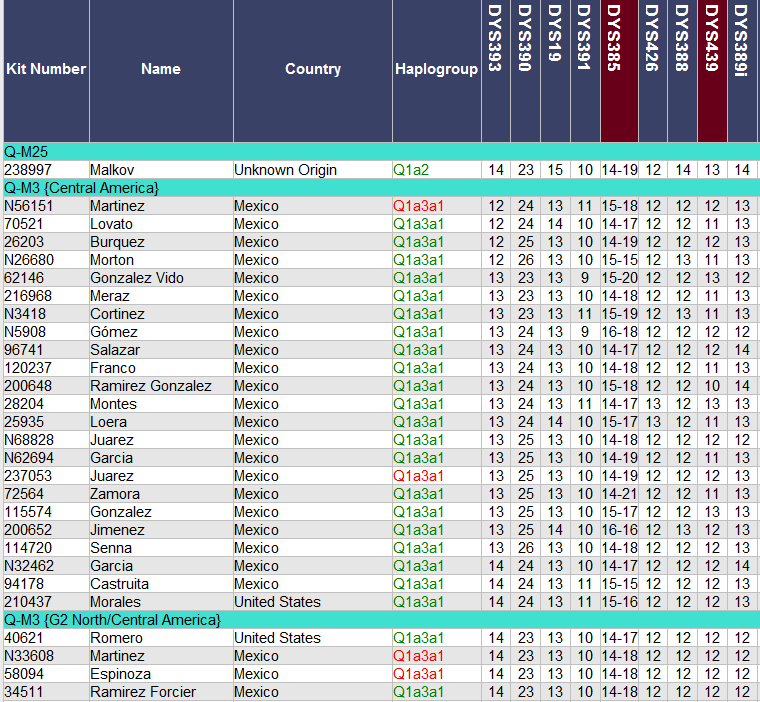 Mapping can be very useful to surname projects, but it’s crucial to haplogroup projects. Here’s the map for all of haplogroup Q. Interesting, but all that this really tells us is that it’s pretty universal. It’s one of two Native American haplogroups, but sub-groups are found throughout Asia and Europe as well. Want to know if you’re Native? Then you’ll have to do SNP testing. The map below shows the oldest known ancestors for those who carry SNP M25. Looking at this map tells you immediately that these people aren’t Native American. But if you live in the US and you’re looking for Native ancestry, and you don’t test to this level, you can be left with the erroneous impression that your haplogroup Q result IS Native when it isn’t. Ah, the power of maps. Most project administrators enable maps. Unfortunately, a few haplogroup projects are at www.worldfamilies.net and those do not use the Family Tree DNA website. This is quite unfortunate, because one of the most powerful functions of haplogroups are the maps. The administrators of haplogroup projects are focused very differently than surname project administrators. This explains the confusion in question 1 about why the surname admin didn’t suggest SNP testing, but the haplogroup project admin did. This introduces a bit of a different topic and that is what motivates haplogroup administrators. I mean, let’s face it, why WOULD you volunteer for this? The answer is simple – passion combined with a smidgen of insanity! Surname administrators are most often the family genealogist. We all know them. We probably are them. It’s what attracted us to genetic genealogy in the first place. They may or may not be terribly familiar with the science of genetics, with SNPs, and may or may not be aware of the benefits of SNP testing. They can, however, recite the details of the original immigrant who arrived in Virginia in 1683 and all their children! Haplogroup project administrators tend to be scientists. I’m very fortunate that my co-admin on the haplogroup E1b1a project is a population geneticist. Yes, they are interested in their surname family, but they are also very focused on their ancient ancestry too – in making that connection between the two and unraveling their story. To them, haplogroup projects represent opportunities not otherwise available. This brings us to the third and fourth kinds of projects, lineage and geographic projects, whose administrators are passionate about their project’s subject. 3. Lineage Projects – Not many of these exist today and most that do are maternal (mitochondrial) DNA lineage projects, such as the descendants of Jane Doe, but I expect as we sort through how to best address lineage with Family Finder tests, lineage projects will become more widely utilized. 4. Geographic projects, the fourth type of project, are all projects other than above. These include many special interest projects, such as the Hatteras Island project, the Cumberland Gap project, the Mothers of Acadia project, the Lumbee project, the Lost Colony project, and many more. These projects are as different as the people who founded them. Some projects are research projects and some are what I term courtesy projects. The Lost Colony projects (and there are three, Y-line, mitochondrial and Family) are research projects. This means that the membership is restricted to people with specific qualifications. I don’t do this to be mean, it’s critical to the research goals of the project. Let me illustrate. The goal of the Lost Colony Y-line project is to test people with a specific set of surnames (the Lost Colonists surnames) who are found in very early eastern North Carolina counties. The project description says this and so does the FAQ. However, 99% of the requests to join the projects say something like this: “I want to compare my results with that of the Lost Colonists.” Well, guess what folks…..we’re trying to figure out what the Lost Colonists’ DNA looks like too. Right now, the people in the Lost Colony Y-line project are good candidates to be descended from the colonists. We’re working to find the colonist families in England to confirm. However, if I let everyone who wants to compare their DNA to these people into the project, how would we ever know who is a true colonist candidate and who is just a comparer??? People get really upset when I explain this to them. And I have to say this…I can’t resist….had they read the project background and goals in the first place….they could have saved themselves and me both some time because they would have known that they don’t qualify, and why. They can support the project in other ways if they are interested. As a project administrator, my largest frustration by far is with people who don’t read what is available for them. I finally set up the Lost Colony Family project as a courtesy project for everyone who wants to test and compare their results to each other. Now there is a place for the frustrated people who can’t join the Lost Colony Y-line or mitochondrial projects. Some geographic (and surname) projects require pedigree charts and a specific genealogy to join. For example, both the Lumbee and Cherokee projects have this requirement. Of course, for a Y-line or mtDNA project, your connection must be through either the paternal line or the maternal line. We receive requests to join daily from people who are connected, but not by Y-line or mtDNA, and they are terribly frustrated and sometimes quite angry when they are told they aren’t qualified to join. It’s not a judgment, it’s the way DNA works. Project administrators are the gatekeepers to be sure the project retains focus and stays on track, which is only fair to the people hoping to learn and gain information by being project members. Project administrators are not there to simply be difficult to random applicants. Most of us really dislike having to decline a join request, even if we do explain. We know that some people simply won’t understand and will be upset or angry with us personally. Not fun. This begs the question of why people are trying to join projects that aren’t good fits for them anyway??? The good news and the bad news is that Family Tree DNA tries to help people find relevant projects. Unfortunately, it’s easy to misinterpret this if you don’t understand the source of this information. Below is an example. 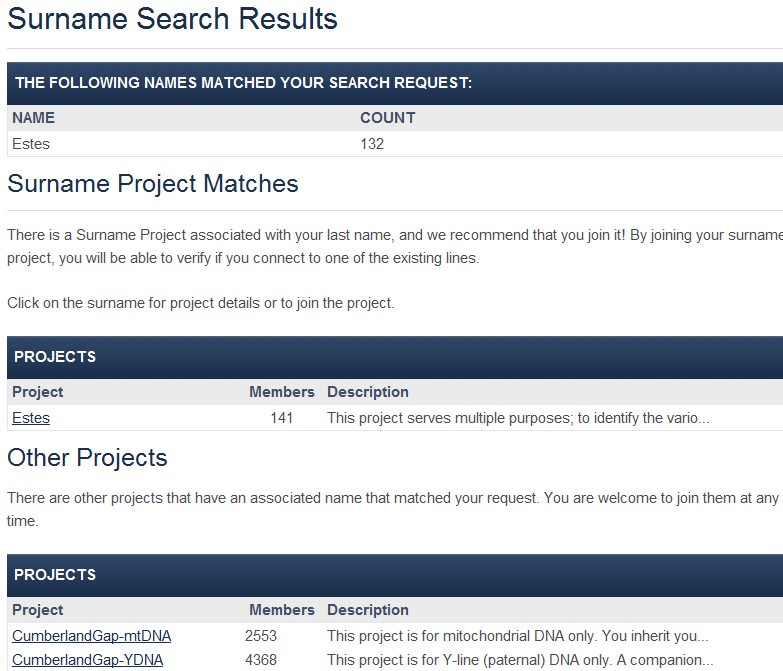 I’ve entered my surname, Estes, and these are the “associated projects” that are shown. Many people interpret these to be “recommended” by Family Tree DNA, and they join each and every one of them. That’s not the goal, nor are all projects appropriate for everyone. These projects are on this list because their administrator included the surname in their project profile, meaning they are interested in attracting people, or at least some people, with that surname. However, they may not be interested in attracting all people with that surname. If your surname is Estes and your family never set foot in America, then obviously the Cumberland Gap group, focused on the convergence of states Kentucky, Tennessee and Virginia, is not likely to be of interest to you. Since it is a courtesy project, you can join if you want, but if it was a project like the Lost Colony projects, then you would need to provide some evidence that your family fits the criteria for those the project is seeking. Ok, so now we’ve talked about the four kinds of projects and how to select the right one for you. Let’s talk a little bit about what you can expect from an administrator and what they expect from you. First of all, administrators are volunteers. They receive no compensation of any sort, no discounts, nothing, except they are eligible to attend the annual DNA Conference in Houston. Eligible to attend does not mean the conference is free. I don’t bring this up as a complaint, it’s just that there has been a persistent rumor that refuses to entirely die that administrators receive some percentage of sales or compensation of some sort for running projects. They don’t and never have. Because they are volunteers, their administration and personal communication styles vary widely. Many don’t have any co-administrators so have no backup or assistance. Some are prompt at answering e-mails, some not. Genetic genealogy and projects are now more than 10 years old. People age, they die, they get distracted and some just haven’t kept up. This field moves very rapidly. If you see a project in trouble, consider offering to help. If that doesn’t work, notify Family Tree DNA. There are published guidelines for administrators. Mostly these deal with privacy and what they can and can’t do. Most of this is intuitive, but maybe not to everyone so it is in writing. Sounds kind of like the scouts doesn’t it? Every project is different. As an administrator, every time I send group messages to large projects, my e-mail address gets blacklisted as a spammer. So I set up a Yahoo group for each of these projects, plus have provided my blog address. Every person receives this information when they join in an automated e-mail which explains explicitly how to join the Yahoo groups and subscribe to my blog. Still, last week, someone left one of these projects with the comment “no communication.” Sigh. Remember what I said about reading??? A few very poorly run projects do exist. In one case, the administrator does not use Family Tree DNA’s public website, nor a private one, and the only way you can obtain project information is by signing up with My Family. In another case, the administrator keeps the results private, much like above, but wrote a book about the surname a couple years ago. That seems to call into question the motivation for the project. These are sad and frustrating experiences for the participants. Use member information and e-mails for spamming, etc. Notify family tree DNA is you feel something is wrong or you have a concern. Consider offering to help if you notice a project languishing. We’ve talked about projects, why they are different and what you can expect from an administrator, but what do they expect from you as a participant, or potential participant? 1. Courtesy – I’ve met many lovely people through genetic genealogy, but I’ve also met my share of real dooseys. I see increasingly more “entitlement attitude” relative to projects with join criteria. In the words of one person who did not meet the criteria, “I deserve to be in this project. I have the right.” I strongly suspect that only the nice people who want to learn will have gotten this far in this article, so I won’t expound further:) For you folks, I don’t need to! 2. READ – Please, please read what is provided relative to the project goals and join criteria. Now this is a double edged sword, because it means the admin needs to be sure to provide this information and keep it current. Maybe I need to look at my project verbiage to see if it needs to be bolded, highlighted or in red! 3. Information – If information is requested, especially in a specific format, please comply as best you can. There is generally a reason for the request. Most admins don’t want to make extra work for you or themselves. Not all projects require information. I ask for a pedigree chart for everyone in my surname projects, and you would be amazed at how many people join the project and then never reply to any of my e-mails – probably about 50%. This is why some admins have gone to requiring a pedigree chart of some sort before people are allowed to join. And providing a pedigree chart does not mean sending a link to your tree at Ancestry. At Ancestry, all the admin can do is write everything down, by hand, IF they can find your line of the family in the chart. Remember, current and recent generations are “private” at Ancestry, so finding the right family line is almost impossible without additional information. 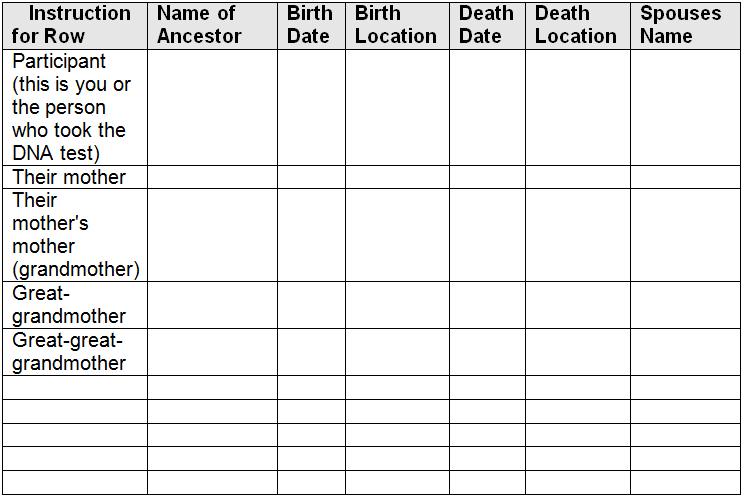 I provide a mini-genealogy form for my project members that has them complete only the direct line directly back from them. Here’s the one for mitochondrial and the one for Y-line is the same except the word mother is changed to father. I hope this has helped dispel some of the confusion surrounding projects, administrators, participants and expectations. This field started out to be quite simple, with only Y surname projects, but as the field has developed and evolved over the last decade, so have projects and with that has come some level of complexity. Joining the correct projects for you, your family and your DNA can be one of the most beneficial aspects of genetic genealogy, allowing you to find family and collaborate your research efforts with others. This entry was posted in Autosomal, Citizen Science, Family Tree DNA, Haplogroups, Mitochondrial DNA, Projects, Y DNA and tagged Introductory DNA by Roberta Estes. Bookmark the permalink. That was very helpful and good. However, you failed to provide the marshmallows! It can sometimes be very hard to find the haplogroup projects and geographical projects. 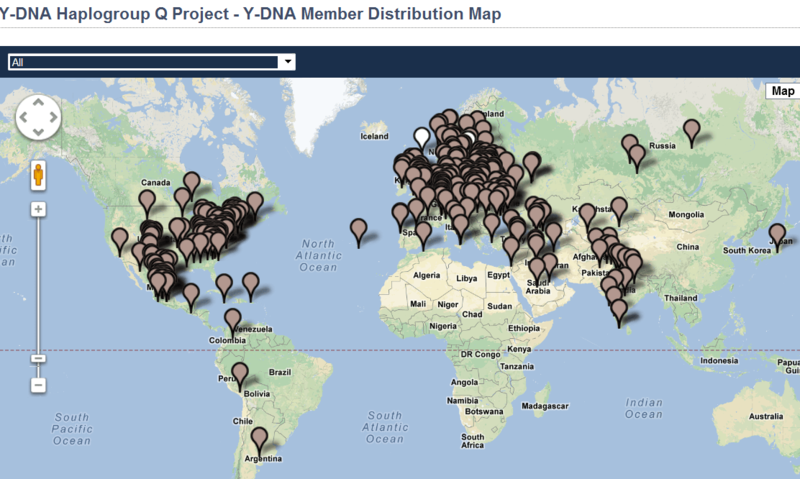 For ease of reference we have listings in the ISOGG Wiki of Y-DNA haplogroup projects (http://www.isogg.org/wiki/Y-DNA_haplogroup_projects), mtDNA haplogroup projects (http://www.isogg.org/wiki/MtDNA_haplogroup_projects) and geographical DNA projects (http://www.isogg.org/wiki/Geographical_DNA_projects). Thank you for the lovely blog, Roberta. It has inspired me to write letters to my members of congress describing my personal experiences with DTC testing and ethics. Let’s see if we can figure out how we’re related. What fun! Your blog is just a must read. Several in my 65-person Ro(d)gers Y-DNA Group have decided to do the new L1335 SNP test. Your “To Snip or not to SNP” and “What is a Haplogroup” spurred us on. Regarding the above article, our official FTDNA Rogers Project administrators, Curtis Rogers and John Olson have been very helpful and helped us add Y-DNA-matching non-Ro(d)gers and Ancestry,com-tested people to the site. One of our non-Ro(d)gers tested L1335 positive, so we’re excited. I’m planning to join a haplogroup project and hope the administrator(s) are as good. Thank goodness for the genealogy volunteers and bloggers! Thank you for your thorough explanations. Family Tree DNA offers you more and different opportunities. Both 23andme and Nat Geo provide you with ethnicity percentages and haplogroups for your Y-line (if you’re male) and your mitochondrial (maternal) lines. 23andMe also provides genealogical cousin matching and health info. Neither Nat Geo nor 23andMe provide you with personal markers for either the Y-line or the mitochondrial DNA. If you want those, Family Tree DNA does offer them. They tell you who specifically you match on those lines specifically. I wrote a blog about the 4 kinds of DNA for genetic genealogy and what you get from each type. http://dna-explained.com/2012/10/01/4-kinds-of-dna-for-genetic-genealogy/ You can also transfer your 23andMe results into Family Tree DNA for $89 and then you will be able to match people within the Family Tree DNA autosomal data base as well. In essence you’ll be fishing in different autosomal pools. So the answer to your questions is, “it depends” on what you’re after and your testing goals.